Owning a tent can really be a real treat. You can use it to camp, use it at the beach, or you can just use it in your backyard. 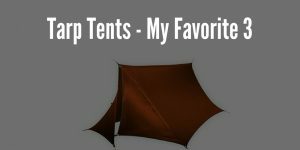 There are so many ways in which you can have fun with your tent. There are also many benefits to camping like the fresh air, the socializing, and the de-stressing involved. 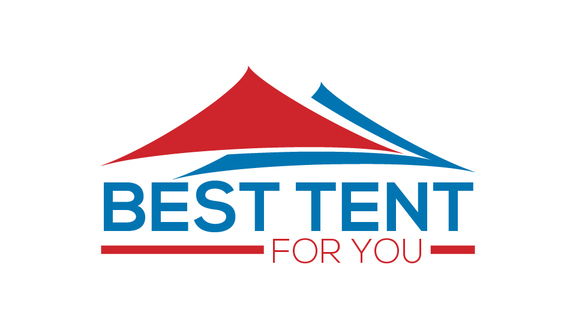 Choosing the right tent can be a daunting task with a number of different tents at your disposal. 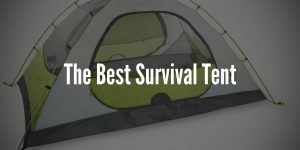 Most of which are good and will do the job, but is there a tent out there that is truly amazing? 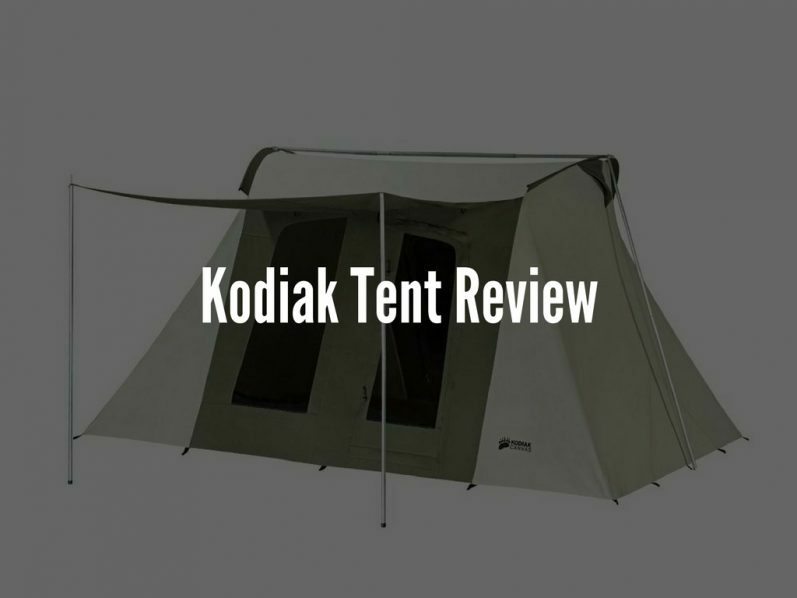 In this Kodiak tent review, we will take a closer look if the Kodiak Canvas Tent is one of them. Who Is This Tent For? 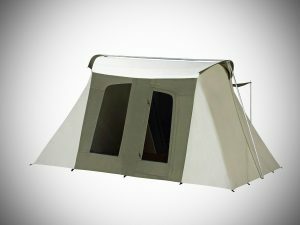 The Kodiak Canvas Flex-Bow tent is large enough to house 8 people (actual size is 10×14 feet). So that’s about 2 small families or a group of friends. However, it will be a rather tight fit when all eight people do occupy the tent at the same time. If eight people do sleep in this tent, then it will be difficult to fit their gear in as well. This will be ok if you have a vehicle nearby where you can keep your gear overnight. Also, you really must have a car close by because when the tent is packed away it is still quite heavy and will be difficult to carry while hiking. There is a decent amount of headroom available for someone as tall as 6 feet in this amazing tent from Kodiak. You will have some clearance between the top of your head and the roof of the tent which is advertised as being 6’6″ in height so there won’t be a need to bend your head when entering the tent. The same goes for when you will want to stand inside the tent. It has a good height so it will assist in avoiding those times when you forget you are in a small tent and you quickly stood up and your head hits the roof and worse, you upset the entire tent. Its floor is made out of 16-ounce polyester reinforced vinyl with welded seams. Most of the seams have a double thickness, especially out in the corners of the tent. The actual tent is made out of canvas so it is water proof. It is also expertly designed to be durable, breathable, and comfortable. The tent is built with premium heavy-duty rubberized plastic material with high-quality seams to ensure long life. It is an all season tent which can handle all types of weather. It’s good in rain, snow and it can even withstand heavy winds. In addition, it has a parcel shelf that looks something like a hammock. It is in a convenient spot within the tent to store food or clothes. Given its material nature, it still is very sturdy and durable. There are also some pouches within the tent. They can be adjusted to fit either side by side or on top of each other. They are a good size and can become very handy to store valuables like keys, wallet, cellphone, etc. Best of all, there are also two doors on either side of this tent. They come with heavy duty self-repairing zippers and they both have full rollout windows. There are two windows next to the doors. One has another convenient storage compartment below it. There are also small vents on either side of the tent. These vents can be utilized during times when all other windows and doors are zipped up, opening both will allow for some cross tent ventilation. Setting up the Kodiak canvas tent is easier than you would expect. Even with its large size and weight. Place the 3 8-inch steel spring rods into the T-Junctions. Then, attached the ridge poles and secure the upright poles into the bottom of the T junction and then simply lift up. You can lift up the awning if you want to provide the entrance with extra shade and also shelter from the rain. When packed away, the tent will be too heavy to backpack with. It is advisable to transport the tent in a vehicle. This Kodiak canvas tent comes in a convenient storage bag that easily rolls open for you to access the tent, heavy-duty 12-inch steel rod stakes, 3 8-inch steel spring rods and 1 inch galvanized steel tubing. Very Spacious – Most 8 person tents usually don’t meet that quota of comfortably housing 8 people. The Kodiak actually does, but it’s a tight squeeze. Eight of you will most likely have to sleep shoulder to shoulder with your gear at your feet. Anywhere up to 6 people would be ideal. Well-Ventilated – All of its doors and windows can be rolled down to provide more than enough ventilation. While rolled down, the doors and windows are still covered by a durable mesh that is fine enough to keep out even the smallest insects. There are 2 small vents that can be opened on either side for those times when all your doors and windows are closed. High-Quality Materials – Everything in this tent is made out of heavy-duty, industrial-style materials. The floor is puncture proof while the tent itself is a 100% cotton duck Hydra-Shield canvas which is fully rain and weather-proof. This is what makes this tent a clear investment. Cheaper tents won’t last as long as this and will need to be replaced soon. Easy Installation – As mentioned earlier, the overall weight of the tent can be misleading because the setup process is simple and it can be fully set up within half an hour. Very Heavy – It can become too heavy for one person to handle and carry around. It is not suitable at all for backpacking and will need to be transported by a vehicle or ATV. Expensive – Quality like this does not come cheap. You will expect to pay much more than what other rival tents cost. But as mentioned earlier, the quality and durability you will get from this tent will ensure a longer lifespan than other tents. All gear compartments and shelves are conveniently placed within the tent. There has been overwhelmingly high praises made towards this tent by its happy customers. Reviews from owners have shown that they fully appreciate the quality and comfort that they get from it. Another great feature of the Kodiak Canvass which seems to be a hit with its owners is the ability to unpack and install the tent quickly and easily. 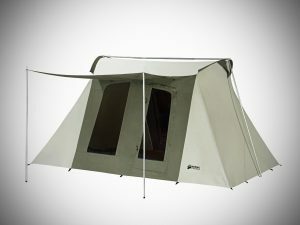 It is definitely one of the best tents on the market today. Owning an 8-person tent like this will be a very comfortable, spacious, and enjoyable experience. Knowing that this experience will last for years to come because of the tents durability and high quality is very reassuring. 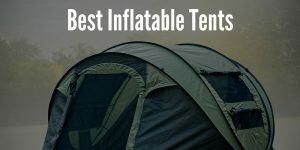 It’s what makes it one of the best tents you will find on the market today especially if you intend to use it with your family. You will certainly get many years of usage out of it and most of all you will also get many years of great memories.